Join many other Charlotte businesses that trust VERSA Technologies to setup your business communications and network systems. VERSA Technologies, Inc. is a single-source provider of business technology solutions in Charlotte. Join fellow Charlotte businesses that trust VERSA Technologies to set up your business communications and network systems. Learn more about our services below. The proper cabling system is an important piece of any business. We understand that every structured cabling system is unique so we offer customizable services to fit your specific needs. 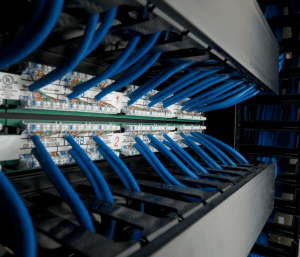 Learn about more about our customizable structured cabling and wiring services. Working with one vendor in Charlotte for your Network Carrier Services will make it much easier to meet your business needs. Whether you’re looking to support your existing IT network or engineer a completely new network design, our industry-certified engineers and technicians can help your business grow. We’ll work with you to customize and maintain your IT infrastructure for optimum performance. Learn more about our IT services in Charlotte. VERSA experts design, install and support leading-edge IP Business Communication Systems in Charlotte. Through our direct partnerships with Toshiba and NEC, you’ll receive state-of-art technology. Trust us to help you attract customers, increase productivity, reduce costs, enhance your image and improve customer satisfaction. Contact our Charlotte office at (704) 335-3996. We also provide business technology solutions in Greensboro, Winston Salem, High Point, and Raleigh.